New York, NY – July 28, 2016 – Pink Floyd will release ‘The Early Years 1965-1972’ on Friday, November 11, 2016. 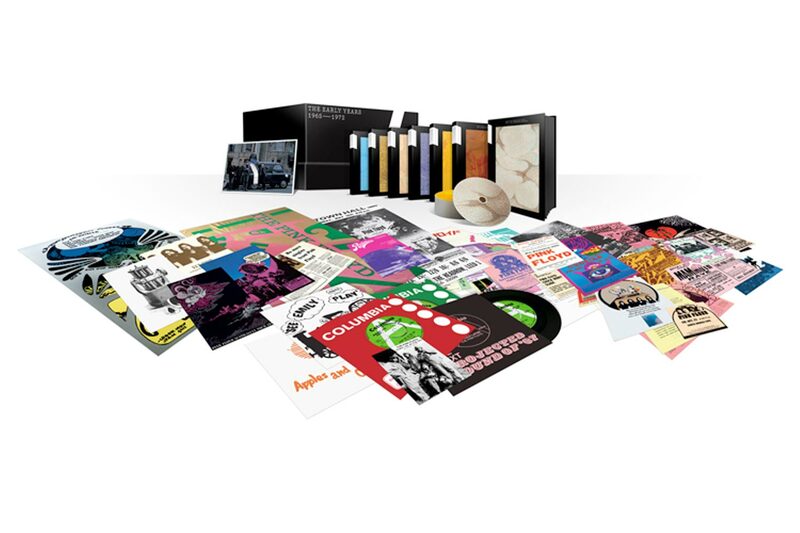 Pink Floyd have delved into their vast music archive, back to the very start of their career, to produce a deluxe 27-disc boxset featuring 7 individual book-style packages, featuring never before released material. The box set will contain TV recordings, BBC Sessions, unreleased tracks, outtakes and demos over an incredible 12 hours, 33 mins of audio (made up of 130 tracks) and over 15 hours of video. Over 20 unreleased songs including 7 hours of previously unreleased live audio, plus 7 hours of rare concert footage are included, along with meticulously produced 7” singles in replica sleeves, collectable memorabilia, feature films and new sound mixes. Previously unreleased tracks include 1967’s Vegetable Man and In The Beechwoods which have been newly mixed for the release. ‘The Early Years 1965-1972’ will give collectors the opportunity to hear the evolution of the band and witness their part in cultural revolutions from their earliest recordings and studio sessions to the years prior to the release of ‘The Dark Side Of The Moon’, one of the biggest selling albums of all time. From the single Arnold Layne to the 20-minute epic Echoes, fans will see the invention of psychedelic progressive rock via an insightful collection that explores the Pink Floyd story from the time Roger Waters, Richard Wright, Nick Mason and Syd Barrett met at London’s Regent Street Polytechnic through to Syd’s departure and David Gilmour joining to form the iconic lineup. In addition to the deluxe set, a 2-CD highlights album ‘The Early Years – CRE/ATION’ will also be available on Friday, November 11, 2016 through Pink Floyd Records. The DVD/Blu-ray includes historic TV performances plus some of Pink Floyd’s own film material. This volume explores the time immediately after Syd Barrett’s departure, when Pink Floyd were still writing singles and at the same time developing their own unique, more instrumentally-based style. There are non-album single releases, plus a recently discovered session at Capitol Records studios in Los Angeles, additional BBC sessions and other tracks. The DVD/Blu-ray includes the recently restored promo clip of Point Me At The Sky, some international TV performances and a selection of song material from other television shows. In 1969 Pink Floyd unveiled their 2-part conceptual live production of ‘The Man’ and ‘The Journey’, covering a 24-hour period of dreaming, waking and other activities. Although never released in that form, some of the songs were used on the ‘More’ soundtrack and the ‘Ummagumma’ album. This volume refers back to ‘The Man’ and ‘The Journey’ tour with live performances in Amsterdam and for the BBC in London, but also includes the bonus tracks from the ‘More’ soundtrack that were used in the film but not on record, plus non-album tracks like the early version of Embryo from the Harvest sampler ‘Picnic’. Video material includes 20 minutes of ‘The Man’/‘The Journey’ rehearsal at the Royal Festival Hall, directed by Anthony Stern, including Afternoon (Biding My Time), The Beginning (Green Is The Colour), Cymbaline, Beset By Creatures Of The Deep and The End Of The Beginning (the last part of A Saucerful Of Secrets), plus other live performance footage from that year. At the end of 1969 and in the early part of 1970, Pink Floyd recorded and mixed their contribution to Michelangelo Antonioni’s alternative view of US society, ‘Zabriskie Point’. Three songs were released on the soundtrack album, and an additional four tracks were added in the expanded CD edition in 1997. Never released on one Pink Floyd disc, this volume compiles remixed and updated versions of the ‘Zabriskie Point’ audio material. In the same year, Pink Floyd scored their first UK Number One album with ‘Atom Heart Mother’, a collaboration with Ron Geesin. The audio includes the first performance for the BBC, featuring an orchestra and choir, as well as, on DVD, the original Quad mix. The video material includes a full hour of Pink Floyd performing live at San Francisco cable TV station KQED plus extracts from historic performances of ‘Atom Heart Mother’, and material from French TV coverage of the St. Tropez festival in Southern France. In 1971 Pink Floyd recorded the ‘Meddle’ album, containing the track ‘Echoes, which took up the entire side of the LP and is regarded by many as laying the groundwork for ‘The Dark Side Of The Moon’, and, as such, is an important part of the Pink Floyd canon. Audio-visual material includes the original unreleased Quad mix of ‘Echoes’ as well as material of live band performances in 1971, including songs performed with Roland Petit and his Marseille ballet company. In 1972 Pink Floyd travelled to Hérouville, north of Paris, to record at Strawberry Studios which is based in the town’s Chateau. In a remarkable two weeks, they wrote and recorded one of their most cohesive albums, ‘Obscured By Clouds’, the soundtrack to Barbet Schroeder’s ‘La Vallée’. 1972 saw the release of ‘Pink Floyd Live At Pompeii’, a film of the band performing without an audience in the historic Roman amphitheatre of Pompeii, directed by Adrian Maben. The video material includes the performances from the ‘Live At Pompeii’ film, edited to new 5.1 audio mixes, plus material from contemporary French TV as well as performances from Brighton Dome in June, 1972 and further performances with the Roland Petit ballet company.